This set of Geotechnical Engineering Interview Questions and Answers for freshers focuses on “Stress Condition in Soil: effective and Actual Pressure”. Explanation: At any plane in a soil mass, the total stress or unit pressure is the total load per unit area. Pore pressure=piezometric head × weight of water. Explanation: Effective pressure ‘σ’ or intergranular pressure is the pressure transmitted from particle through their point of contact through the soil mass above the plane. Explanation: The neutral pressure does not have measurable influence on the mechanical property of the soils, such as shearing resistance. 5. The total pressure in a soil mass consists of _____________ distinct components. Explanation: i. Effective pressure or intergranular pressure. ii. Neutral pressure or pore pressure, are the two components of total pressure. Explanation: As the neutral pressure should not have any effect on void ratio or property of soil, it is transmitted through pore fluid. Explanation: Total vertical pressure at any plane is equal to the sum of effective pressure and the total pressure i.e. σ = σ’ + u. Explanation: Factor of unit cross-section varies with the degree of saturation, soil structure, process by which the soil present degree of saturation and stress change. Explanation: For degree of saturation of S ≥90%, it is recommended to take χ as unity (i.e., 1). 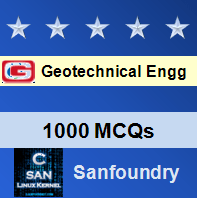 To practice all areas of Geotechnical Engineering for Interviews, here is complete set of 1000+ Multiple Choice Questions and Answers.